Summer has come and gone and I’ve been traveling for most of it. These next few weekends though, I'm in the city and I'm on mission to savor what's left of my summer. One of my favorite parts about summer is the simplicity of my daily routine. It goes—sunscreen, mascara and I'm out. This works because my skin loves the sun; it brings out my freckles and helps clear up trouble areas. I don't want to over do it with the sun (for wrinkles-sake) so I never leave the house without sunscreen. I prefer Glossier’s Invisible Shield, because I love it's texture and it's light enough that my skin doesn't break out. For aftersun remedies, I've used this Herbivore Aloe mist which is only nice if you're not a fan of goopy, cold, sticky aloe!!! My more fleshed out makeup routine has been: Chanel mascara (a gift from The Wing), RMS "Un" Cover-Up, Glossier’s Skin Tint and a bronzer stick. In more recent news, I've been doing the—shampoo once a week—bit. I recommend. For the most part it's just been water and Golden Mermaid Spray. (It turns out my hair's natural oils are a chill situation.) 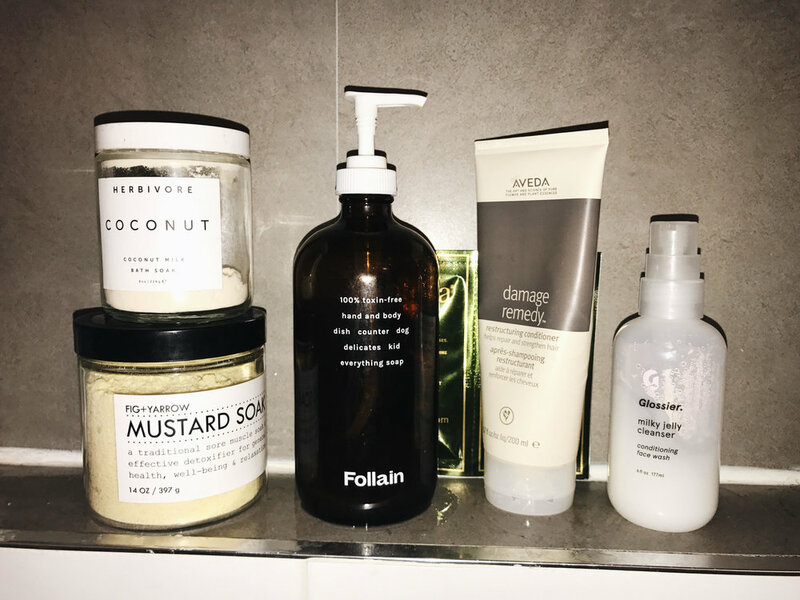 Of course body wash is still a must, and Follain’s body soap (in lemongrass) is my favorite thing in my shower. Besides savoring my freckles and the ease of summer routines—I'll be gallivanting around the city I call home. I'll go to my current favorite vegan restaurants: abcV and Screamers Pizza. I will wander through boutiques and vintage shops like, Duo and Star Struck Vintage. I'll drink my favorite iced coffee from Foragers. And lastly, I'll spend a lot of time writing. Get ready for what I expect to be an Instagram explosion as I live up what's left of my summer in the city. Socks, Life and Other Things I'm confused about.